The composite cladding is the most modern infrastructure item in both commercial and residential buildings. It serves as a both beautification and weatherproofing item in establishments, and it supports the framework of the infrastructure where they are installed. This material is highly robust and high resistant to absorption of water. However, almost every range of composite cladding found in the market is maintenance free, but rarely do they need maintenance to improve its longevity. Almost every cladding is resistant to all types of light chemical materials, so you won't have to fear when using a new type of cleaning item. Cleaning and maintaining different composite claddings are quite easy and efficient. It always best to maintain the lustre of the cladding as it retains the pristine condition as well as holds the resistivity factor of the top layer of cladding. Many people hesitate to maintain the claddings fitted in their house as they think they are maintenance free. You can either clean them by yourself, which will save a lot of your money, but if you don't have time then call a local cleaning agencies. Maintaining and cleaning any range of composite cladding doesn’t need any specific technique or methods, and they can be cleaned using traditional methods. Following points will you give you a broad idea about how you can clean and maintain different ranges of composite cladding? Every range of cladding used in outer areas of partitions or exterior can be easily cleaned using standard detergent. You should mix a bucket of water at room temperature or slightly warm with two big cups of detergent. Then either you can use a ladder or long cleaning stands to clean composite claddings. Most of the experts advise that you should clean cladding with a soft cloth as it facilitates smooth cleaning without any scratch. Some people prefer using ladders to clean claddings as they can quickly clean every area and remove dust from the corners. However, you can use a long handled mop to reach higher areas although you would find it difficult to reach the corners. It is always recommended to immediately clean grease, oil or any kind of stain as it will affect the top layer of the cladding. You should not allow any form of stain to sit on the coating for an extended period of time as it will get soaked and it would become very difficult to remove them afterward. It would be a smart move to eliminate any kind of paint from cladding immediately as paints get deposited very quickly. You should also follow instructions provided by the manufacturers as they will guide you appropriately. The cladding has high resistance to all type of weather condition, but they are not resistance to strong solvents and alkalis. You should also avoid using any hard material that might cause crack which allows moisture to enter into the inner parts. During any kind of renovation, always cover all the claddings so that they don’t have any kind of stains. 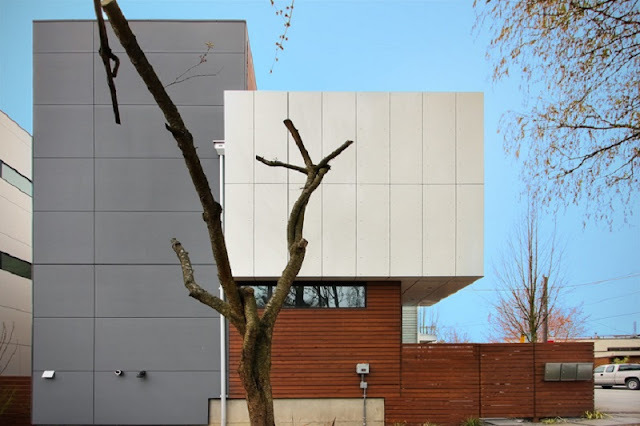 Many manufacturers insist clients for not using any kind of pesticide near composite cladding because chemicals present in them can affect the colour of the top surface. You can even use different type’s polishes, oils or waxes for maintenance of the lustre of the cladding and it also increases its weatherproofing attribute. However, it is always advisable to avoid using cheap quality product which often causes smudge on the top layer.